There are amazing adventures found in the pages of books, and you don't have to take LaVar Burton's word for it. Oh literature! A medium with a collection so vast its a wonder we've had time to hone storytelling in any other form. When novels are adapted to film, there is frequently something missing, a certain 'je ne sais quoi' lacking from visuals alone. "The book is better" has become so incessant its almost become a mantra for literary snobs around the world. There are so few contrary cases, we might as well just presume the book is always better and leave it at that. Thus, it is no surprise video games frequently look towards literature for inspiration and guidance, for better or worse. Some go so far as to present themselves as a close kin to literature, a cousin born into the video game family but with such brilliant red hair there must be a touch of novel in him. 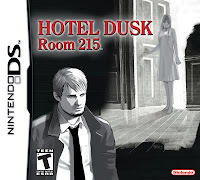 Which brings me to Hotel Dusk: Room 215, developed by Cinq, published by Nintendo and first launched in Japan. The is played with the DS on its side, resembling how one holds a book. This devotion to its format lineage belittles its successful literature-videogame half-breed brethren. A portable noir videogame set in a shady 1979 Californian Hotel intrigued me the way only a dark mystery can. 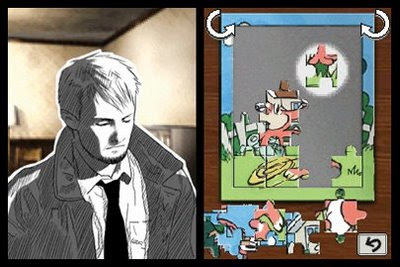 Perhaps the game would be a serious drama with puzzle elements I thought, a procedural cop drama meets Prof. Layton. It was not. Allow me to get the flaws out of the way: The secrets of Hotel Dusk unfold at an aggravatingly slow pace. The vast majority of character interaction is through cliche ridden dialogue, which scrolls far too slowly for fast readers or any literate readers intrigued enough in the story to set their own pace. Without the ability to enable instant text, the plot crawls along slowly regardless of story elements. Dialogue nodes are merely breaks between unchanging or dead-end conversations and the available puzzles in between chatter are rare and childishly simple. To make matters worse, the game insults the player by giving them an easy multiple choice test at the end of every chapter. To top things off, the story reads like a vapid airport mystery novel. After struggling with Hotel Dusk, I'm inclined to agree with the videogame segregationists, whose flag reads "Books are books, games are games, and never the two shall join." Reverting to my tendency of making food based analogies, this meshing of the two mediums creates more of a "liver and pancakes" than "chicken and waffles" combination. Yet some games combine aspects of the mediums remarkably well. Why does Hotel Dusk fail where others have forged a brilliant path? The aforementioned Prof. Layton, possibly my favorite DS game, tells a compelling and comical story interlaced with puzzles which seem at first to have little relevance to the story. Given, Layton is more akin to a cartoon than a novel with its animated cut scenes, but the example is important none the less. 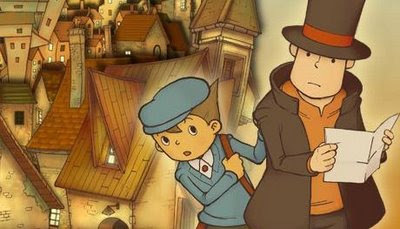 Layton maintains a well paced story bolstered by gameplay, although its puzzles could have easily been collected into a game with no narrative at all. On the visually opposite spectrum are interactive fictions (IF), experiences that exist in the borderlands of gaming. Many of these text-based adventures, such as Emily Short's Galatea, are completely devoid of visual elements. Regardless, there are those designers still creating surprisingly fun and intense games that far surpass the "Choose Your Own Adventure" novels of the early eighties and nineties. These IFs frequently push the boundaries of the medium and can be incredibly innovative, particularly with dialogue. Like 'escape the room' puzzles, many games in the IF genre reveal a hidden depth far more intriguing than what Hotel Dusk provides. Both Layton and Galatea share many characteristics with literature, yet succeed where Hotel Dusk fails. What these games have that Hotel Dusk does not is interactivity through meaningful choice, or at least the illusion of meaningful choice. The element of video games that makes the medium so unique, and the most important element to keep when blending it with literature. Unfortunately, the puzzles are too simple to feel interactive and the dialogue is linear, only incorrect responses alter the story occasionally by ending the game. The interactivity of choice in interactive fiction takes the form of narrative control. The player drives the story forward, changing pacing and outcome on a whim. The narrative is defined by the players, not regurgitated to them like a book on tape. But even if the story is fixed, involvement in gameplay is choice enough to envelope the player in the experience. Solving puzzles in Prof. Layton is rewarding by itself, but these become even more meaningful when tied to the story, setting the pace without being restrictive. It is easy enough to find parties of contrarians eager to debate the definition of "videogame." I am comfortable with keeping the term nebulous. Even so, I have a hard time considering Hotel Dusk a videogame because it is an empty invitation to play. There is space for more literature-based videogames (Dante's Inferno and Tom Clancy's Splintercell don't count), but wrapping a poor piece of fiction in the guise of game without choice is a sin, belittling both crafts. Harsh critique. I like it. I understand how you arrived at that conclusion but I must admit that I enjoyed that game. The story might be sub-par for literary standards but quite mature and detailed for a video game. I really enjoyed the visual style as well. There is no way my Father would play Prof. Layton - it looks childish and silly. He might give Hotel Dusk a try, though. As for the interactivity: I agree, the interactive parts play a minor role for how the story plays out. However, I thought it was a valid approach. I would compare it to an illustrated book, but instead of illustrations, you get interactive parts. Keeping that analogy, what you have in mind is more of a graphic novel. While graphic novels can be a very exciting way to combine images and text, I wouldn't call "just" an illustrated book necessarily a sin. Worked perfectly for something like Alice in Wonderland. Btw, at this E3, I might have been one of the very few people who was excited about Women's Murder Club. You're right about the maturity level in comparison to Prof. Layton, but it wasn't explicitly adult of anything either. Forgive my "sin" hyperbole, I was being a sensationalist. I also think there is a place for illustrated books. However, Hotel Dusk purports to be a game and gives you some control (movement, order of answers, etc). Yet its utterly meaningless and serves only slow the pace. Which I interpret as insulting to the player. Had it just been an animated story, then I would leave it at that. It's true that many of the interactive parts of Hotel Dusk serve no purpose. I was also disappointed by that. In a way I'm still am but there is also an alternative take on this. That's why I drew the comparison to an illustrated book. I mean a book in which the text alone is enough to tell the story. In such a book, having illustrations might seem like a superfluous waste of space, just like the interactive parts of Hotel Dusk is a waste of time. On the other hand, one can also accept the illustration/interactions as exactly what they are: a means to themselves. Tiny vignettes to underline the text. When I tested the first chapter with my Girlfriend, it was exactly the pointless suitcase opening "minigame" which made a lasting impression on her. On the other hand, I'm not quite sure what the difference is between Hotel Dusk and the empty dialogue choices on Mass Effect. Got to think that trough some more. Your review made me stumble upon some curious bit of thought. In all media but especially in games, our evaluation of a work is heavily dependent on our expectations. So the story of Hotel Dusk is high brow for Gears of War standarts but pretty shallow for serious literature. I believe you were so critical about Hotel Dusk because the visual style, the text-heavy content and the overall theme suggests a very deep, intellectual game. Which it isn't quite. But there is the conundrum: as a game developer, you want to keep the expectations of your audience high in order to make people buy the game in the first place. However, this very behavior will also make more likely for your audience to be disappointed with the game because it will raise the standards by which they will judge your game. I'm with you on the illustrated book idea, and how it doesn't satisfy my expectations. Which I try to temper and made sure not to call this post a review, focusing instead on choice in "interactive" fiction. My one contention is that even if I did not expect Hotel Dusk to be deep and serious (though you're right, I did), I would still have been irked by non-interactivity. Similarly to Layton, which surprised me with its depth. Interesting take, especially your view that Layton worked, and Dusk didn't. I also enjoyed both, but for identical reasons. Both were pleasant stories -- one more adult, one more fanciful -- that simply ask you to nudge them along by using your brain. Drawing a sharp contrast between the two seems mostly based on expectations though. One was cartoony and maybe deeper than you'd think, the other had a more artsy feel but only simple playable elements that don't live up to what you'd hope was a more sophisticated game. In the end though, lack of interactivity could be extended far beyond games that mimic fiction. Final Fantasy doesn't offer a lot of meaningful choice; neither do most action games. It seems like the main complaint we all should have isn't that we can't make enough choices, but that if games are making choices for us, they could at least do us the courtesy of making them part of better stories, period. I admit, my expectations were high for Hotel Dusk. Certainly higher than they should have been. Your comment makes a good point about meaninful choice, which is such a tricky idea. I'm a proponent of the illusion of choice arguement over actual meaninful choice, but that is another matter. I would differentiate choice and interactivity. Where as Final Fantasy might not be full of meaningful choice, it still makes me feel involved in the choices that are made for me. It's including me in the story the way Hotel Dusk did not. web page. You should however read the terms and conditions for extra expenses or restrictions, such as your reservation being non-refundable.